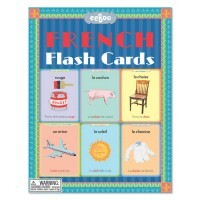 This Eeboo's set of Responsibility Flash Cards is a great play assistant in learning good citizenship rules for kids. 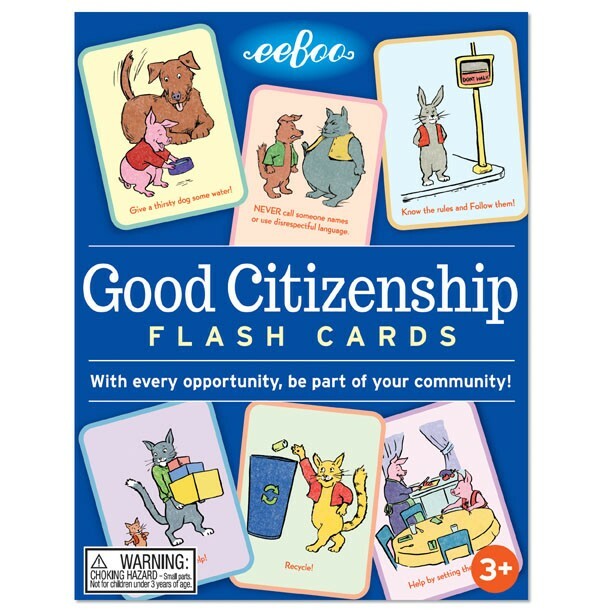 This incredibly educational Eeboo card game kindly introduces the principles of good citizenship for the youngest citizens. 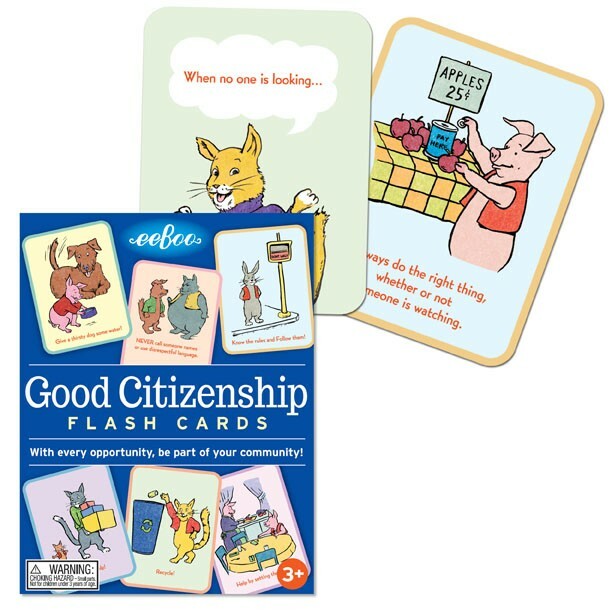 Good Citizenship Responsibility Flash Cards features kids friendly illustrations presenting a polite pig and a caring company of friendly animals that demonstrate good behavior choices. 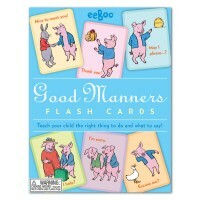 These manners and good behavior teaching cards show the examples of real life situations in which children might need to find the right way to respond. 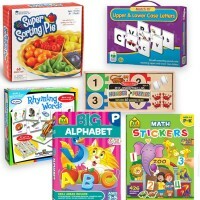 When you see someone working hard to do his job… Compliment his work! 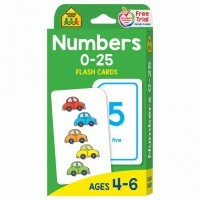 When people discuss the problems in your community… Listen and think, may be you can come up with a solution! 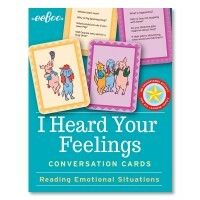 If someone tells something mean about your friend… Defend your friend and stop meanness! 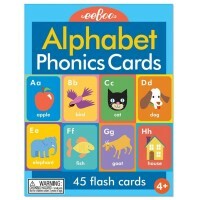 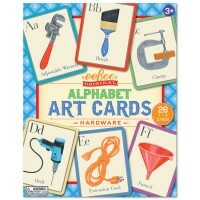 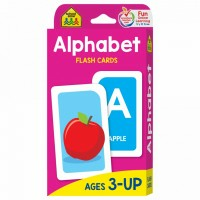 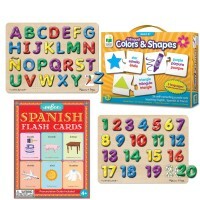 This learning flash cards set from Educational Toys Planet is a 'must-have' toy to build character, make good moral decisions, become a good citizen for your family, class, community and yourself! 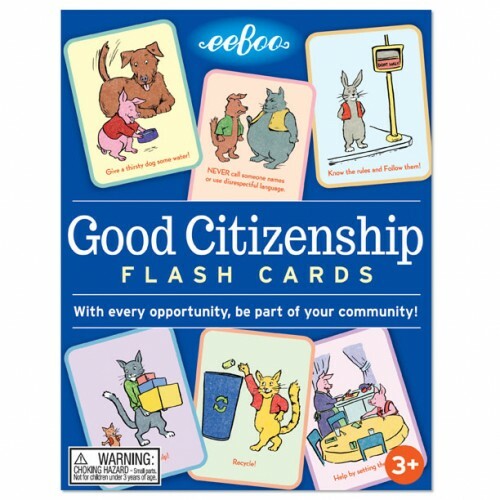 Good Citizenship Responsibility Flash Cards includes 48 flash cards that measure 4.5 x 6 inches and come in a sturdy sliding tray box for easy storage. 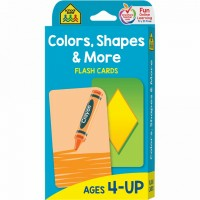 Dimensions of package 1.2" x 5" x 6.5"
Write your own review of Good Citizenship Responsibility Flash Cards.